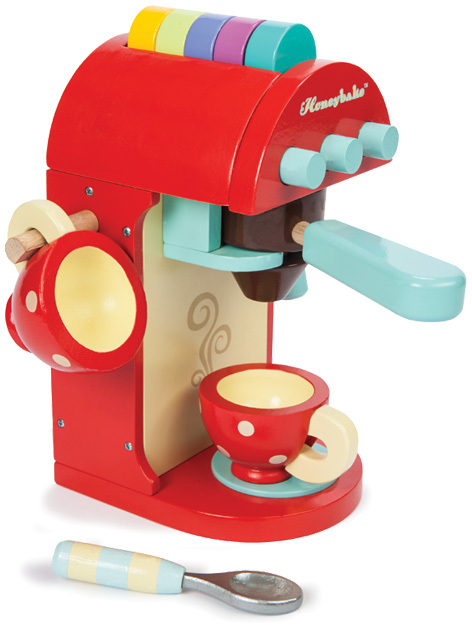 Le Toy Van have launched a brilliant new product with the release of the fantastic Café Machine in the ever popular and expanding Honeybake range of wooden toys. Designed for children of 3 and over, this bright red painted drinks machine mimics all the best design ideas from the real coffee shop versions. Two cups and a spoon are included in the Café Machine set as well as a supply of coloured coffee pods that can be placed in the removable filter. These are neatly stored on the top of the machine and there’s even a pretend milk frother for even more realism. This set is scaled to match many of the other products in the Honeybake collection. Size is height 21 cm, depth 19 cm, width 11 cm. Le Toy Van also make a fantastic selection of other wooden toys including farm sets, castles, pirate ships and some gorgeous dolls houses. Boys in particular love the garages and matching vehicles that can be raced around the printed play mat. The Budkins wooden character figures also have their own play environments such as a hospital or fire station. Please tell us what you think of the Honeybake Café Machine by Le Toy Van.